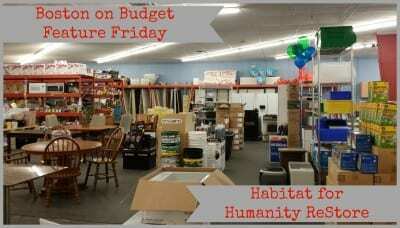 Feature Friday: Habitat for Humanity ReStore! If you are doing some upgrades to your house or apartment or just looking to redecorate this spring/summer, you may want to check out the Habitat for Humanity ReStore in West Roxbury (next to JoAnn’s Fabric on the VFW Parkway)! I went a few weeks back for their anniversary celebration for the first time. As you may know, my husband and I bought a total fixer upper, and completely gutted in. I am (unfortunately) very aware of prices of very random tools, housing supplies, and furniture. There are some items that we wish we bought there awhile back because we definitely would have saved some money. There are a lot of different items available at the Habit for Humanity ReStore such as kitchen cabinets, doors, hardware, tools, potting soil, dining room tables, end tables, and much more! Some prices were comparable to Home Depot or Lowes, but some prices were a little better. Habitat for Humanity ReStore happily accepts donations of new and gently used donations to sell to bargain hunters to raise money to complete their mission of eliminating substandard housing. Have you been to a Habitat for Humanity ReStore before? Are there any stores or tricks I am missing with my house renovation project to save more money? For more information about the Habitat for Humanity ReStore, please head here. The nonprofit Reuse Center at Boston Building Resources has a wide selection of used and new products for home improvement, all of which have been donated. Customers with low and moderate incomes receive a substantial discount.